These technologies are used to develop machines that can substitute for humans and replicate human actions. Robots can be used in many situations and for lots of purposes, but today many are used in dangerous environments (including bomb detection and deactivation), manufacturing processes, or where humans cannot survive (e.g. in space). Robots can take on any form but some are made to resemble humans in appearance. This is said to help in the acceptance of a robot in certain replicative behaviors usually performed by people. Such robots attempt to replicate walking, lifting, speech, cognition, and basically anything a human can do. Many of today's robots are inspired by nature, contributing to the field of bio-inspired robotics. The concept of creating machines that can operate autonomously dates back to classical times, but research into the functionality and potential uses of robots did not grow substantially until the 20th century. Throughout history, it has been frequently assumed by various scholars, inventors, engineers, and technicians that robots will one day be able to mimic human behavior and manage tasks in a human-like fashion. Today, robotics is a rapidly growing field, as technological advances continue; researching, designing, and building new robots serve various practical purposes, whether domestically, commercially, or militarily. Many robots are built to do jobs that are hazardous to people such as defusing bombs, finding survivors in unstable ruins, and exploring mines and shipwrecks. Robotics is also used in STEM (science, technology, engineering, and mathematics) as a teaching aid. The advent of nanorobots, microscopic robots that can be injected into the human body, could revolutionize medicine and human health. The word robotics was derived from the word robot, which was introduced to the public by Czech writer Karel Čapek in his play R.U.R. (Rossum's Universal Robots), which was published in 1920. The word robot comes from the Slavic word robota, which means labour/work. The play begins in a factory that makes artificial people called robots, creatures who can be mistaken for humans – very similar to the modern ideas of androids. Karel Čapek himself did not coin the word. He wrote a short letter in reference to an etymology in the Oxford English Dictionary in which he named his brother Josef Čapek as its actual originator. According to the Oxford English Dictionary, the word robotics was first used in print by Isaac Asimov, in his science fiction short story "Liar! ", published in May 1941 in Astounding Science Fiction. Asimov was unaware that he was coining the term; since the science and technology of electrical devices is electronics, he assumed robotics already referred to the science and technology of robots. In some of Asimov's other works, he states that the first use of the word robotics was in his short story Runaround (Astounding Science Fiction, March 1942), where he introduced his concept of The Three Laws of Robotics. However, the original publication of "Liar!" predates that of "Runaround" by ten months, so the former is generally cited as the word's origin. Robots all have some kind of mechanical construction, a frame, form or shape designed to achieve a particular task. For example, a robot designed to travel across heavy dirt or mud, might use caterpillar tracks. The mechanical aspect is mostly the creator's solution to completing the assigned task and dealing with the physics of the environment around it. Form follows function. All robots contain some level of computer programming code. A program is how a robot decides when or how to do something. In the caterpillar track example, a robot that needs to move across a muddy road may have the correct mechanical construction and receive the correct amount of power from its battery, but would not go anywhere without a program telling it to move. Programs are the core essence of a robot, it could have excellent mechanical and electrical construction, but if its program is poorly constructed its performance will be very poor (or it may not perform at all). There are three different types of robotic programs: remote control, artificial intelligence and hybrid. A robot with remote control programing has a preexisting set of commands that it will only perform if and when it receives a signal from a control source, typically a human being with a remote control. It is perhaps more appropriate to view devices controlled primarily by human commands as falling in the discipline of automation rather than robotics. Robots that use artificial intelligence interact with their environment on their own without a control source, and can determine reactions to objects and problems they encounter using their preexisting programming. Hybrid is a form of programming that incorporates both AI and RC functions. As more and more robots are designed for specific tasks this method of classification becomes more relevant. For example, many robots are designed for assembly work, which may not be readily adaptable for other applications. They are termed as "assembly robots". For seam welding, some suppliers provide complete welding systems with the robot i.e. the welding equipment along with other material handling facilities like turntables etc. as an integrated unit. 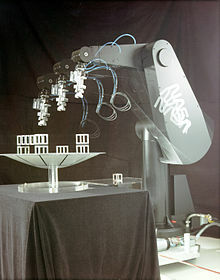 Such an integrated robotic system is called a "welding robot" even though its discrete manipulator unit could be adapted to a variety of tasks. Some robots are specifically designed for heavy load manipulation, and are labelled as "heavy duty robots". Industrial robots. Robots are increasingly used in manufacturing (since the 1960s). According to the Robotic Industries Association US data, in 2016 automotive industry was the main customer of industrial robots with 52% of total sales. In the auto industry, they can amount for more than half of the "labor". There are even "lights off" factories such as an IBM keyboard manufacturing factory in Texas that was fully automated as early as 2003. Construction robots. Construction robots can be separated into three types: traditional robots, robotic arm, and robotic exoskeleton. Agricultural robots (AgRobots). The use of robots in agriculture is closely linked to the concept of AI-assisted precision agriculture and drone usage. 1996-1998 research also proved that robots can perform a herding task. Medical robots of various types (such as da Vinci Surgical System and Hospi). Kitchen automation. Commercial examples of kitchen automation are Flippy (burgers), Zume Pizza (pizza), Cafe X (coffee), Makr Shakr (cocktails), Frobot (frozen yogurts) and Sally (salads). Home examples are Rotimatic (flatbreads baking) and Boris (dishwasher loading). Robot combat for sport – hobby or sport event where two or more robots fight in an arena to disable each other. This has developed from a hobby in the 1990s to several TV series worldwide. Cleanup of contaminated areas, such as toxic waste or nuclear facilities. Actuators are the "muscles" of a robot, the parts which convert stored energy into movement. By far the most popular actuators are electric motors that rotate a wheel or gear, and linear actuators that control industrial robots in factories. There are some recent advances in alternative types of actuators, powered by electricity, chemicals, or compressed air. Muscle wire, also known as shape memory alloy, Nitinol® or Flexinol® wire, is a material which contracts (under 5%) when electricity is applied. They have been used for some small robot applications. EAPs or EPAMs are a plastic material that can contract substantially (up to 380% activation strain) from electricity, and have been used in facial muscles and arms of humanoid robots, and to enable new robots to float, fly, swim or walk. Elastic nanotubes are a promising artificial muscle technology in early-stage experimental development. The absence of defects in carbon nanotubes enables these filaments to deform elastically by several percent, with energy storage levels of perhaps 10 J/cm3 for metal nanotubes. Human biceps could be replaced with an 8 mm diameter wire of this material. Such compact "muscle" might allow future robots to outrun and outjump humans. Computer vision systems rely on image sensors which detect electromagnetic radiation which is typically in the form of either visible light or infra-red light. The sensors are designed using solid-state physics. The process by which light propagates and reflects off surfaces is explained using optics. Sophisticated image sensors even require quantum mechanics to provide a complete understanding of the image formation process. Robots can also be equipped with multiple vision sensors to be better able to compute the sense of depth in the environment. Like human eyes, robots' "eyes" must also be able to focus on a particular area of interest, and also adjust to variations in light intensities. Robots need to manipulate objects; pick up, modify, destroy, or otherwise have an effect. 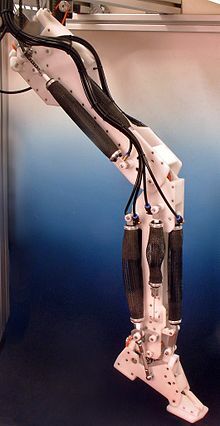 Thus the "hands" of a robot are often referred to as end effectors, while the "arm" is referred to as a manipulator. Most robot arms have replaceable effectors, each allowing them to perform some small range of tasks. Some have a fixed manipulator which cannot be replaced, while a few have one very general purpose manipulator, for example, a humanoid hand. Learning how to manipulate a robot often requires a close feedback between human to the robot, although there are several methods for remote manipulation of robots. Balancing robots generally use a gyroscope to detect how much a robot is falling and then drive the wheels proportionally in the same direction, to counterbalance the fall at hundreds of times per second, based on the dynamics of an inverted pendulum. Many different balancing robots have been designed. While the Segway is not commonly thought of as a robot, it can be thought of as a component of a robot, when used as such Segway refer to them as RMP (Robotic Mobility Platform). An example of this use has been as NASA's Robonaut that has been mounted on a Segway. A one-wheeled balancing robot is an extension of a two-wheeled balancing robot so that it can move in any 2D direction using a round ball as its only wheel. Several one-wheeled balancing robots have been designed recently, such as Carnegie Mellon University's "Ballbot" that is the approximate height and width of a person, and Tohoku Gakuin University's "BallIP". Because of the long, thin shape and ability to maneuver in tight spaces, they have the potential to function better than other robots in environments with people. Tank tracks provide even more traction than a six-wheeled robot. Tracked wheels behave as if they were made of hundreds of wheels, therefore are very common for outdoor and military robots, where the robot must drive on very rough terrain. However, they are difficult to use indoors such as on carpets and smooth floors. 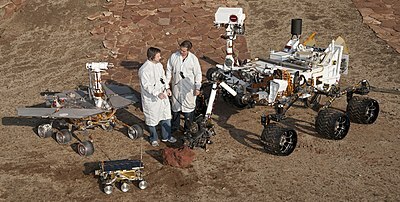 Examples include NASA's Urban Robot "Urbie". The zero moment point (ZMP) is the algorithm used by robots such as Honda's ASIMO. The robot's onboard computer tries to keep the total inertial forces (the combination of Earth's gravity and the acceleration and deceleration of walking), exactly opposed by the floor reaction force (the force of the floor pushing back on the robot's foot). In this way, the two forces cancel out, leaving no moment (force causing the robot to rotate and fall over). However, this is not exactly how a human walks, and the difference is obvious to human observers, some of whom have pointed out that ASIMO walks as if it needs the lavatory. ASIMO's walking algorithm is not static, and some dynamic balancing is used (see below). However, it still requires a smooth surface to walk on. A more advanced way for a robot to walk is by using a dynamic balancing algorithm, which is potentially more robust than the Zero Moment Point technique, as it constantly monitors the robot's motion, and places the feet in order to maintain stability. This technique was recently demonstrated by Anybots' Dexter Robot, which is so stable, it can even jump. Another example is the TU Delft Flame. Two robot snakes. Left one has 64 motors (with 2 degrees of freedom per segment), the right one 10. Several different approaches have been used to develop robots that have the ability to climb vertical surfaces. One approach mimics the movements of a human climber on a wall with protrusions; adjusting the center of mass and moving each limb in turn to gain leverage. 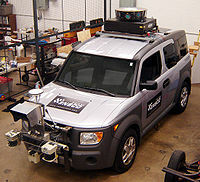 An example of this is Capuchin, built by Dr. Ruixiang Zhang at Stanford University, California. Another approach uses the specialized toe pad method of wall-climbing geckoes, which can run on smooth surfaces such as vertical glass. Examples of this approach include Wallbot and Stickybot. China's Technology Daily reported on November 15, 2008, that Dr. Li Hiu Yeung and his research group of New Concept Aircraft (Zhuhai) Co., Ltd. had successfully developed a bionic gecko robot named "Speedy Freelander". 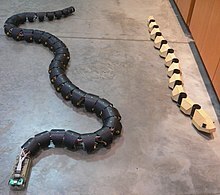 According to Dr. Li, the gecko robot could rapidly climb up and down a variety of building walls, navigate through ground and wall fissures, and walk upside-down on the ceiling. It was also able to adapt to the surfaces of smooth glass, rough, sticky or dusty walls as well as various types of metallic materials. It could also identify and circumvent obstacles automatically. Its flexibility and speed were comparable to a natural gecko. A third approach is to mimic the motion of a snake climbing a pole. It is calculated that when swimming some fish can achieve a propulsive efficiency greater than 90%. Furthermore, they can accelerate and maneuver far better than any man-made boat or submarine, and produce less noise and water disturbance. Therefore, many researchers studying underwater robots would like to copy this type of locomotion. Notable examples are the Essex University Computer Science Robotic Fish G9, and the Robot Tuna built by the Institute of Field Robotics, to analyze and mathematically model thunniform motion. The Aqua Penguin, designed and built by Festo of Germany, copies the streamlined shape and propulsion by front "flippers" of penguins. Festo have also built the Aqua Ray and Aqua Jelly, which emulate the locomotion of manta ray, and jellyfish, respectively. In 2014 iSplash-II was developed by PhD student Richard James Clapham and Prof. Huosheng Hu at Essex University. It was the first robotic fish capable of outperforming real carangiform fish in terms of average maximum velocity (measured in body lengths/ second) and endurance, the duration that top speed is maintained. This build attained swimming speeds of 11.6BL/s (i.e. 3.7 m/s). The first build, iSplash-I (2014) was the first robotic platform to apply a full-body length carangiform swimming motion which was found to increase swimming speed by 27% over the traditional approach of a posterior confined waveform. Though a significant percentage of robots in commission today are either human controlled or operate in a static environment, there is an increasing interest in robots that can operate autonomously in a dynamic environment. These robots require some combination of navigation hardware and software in order to traverse their environment. In particular, unforeseen events (e.g. people and other obstacles that are not stationary) can cause problems or collisions. Some highly advanced robots such as ASIMO and Meinü robot have particularly good robot navigation hardware and software. Also, self-controlled cars, Ernst Dickmanns' driverless car, and the entries in the DARPA Grand Challenge, are capable of sensing the environment well and subsequently making navigational decisions based on this information. Most of these robots employ a GPS navigation device with waypoints, along with radar, sometimes combined with other sensory data such as lidar, video cameras, and inertial guidance systems for better navigation between waypoints. One can imagine, in the future, explaining to a robot chef how to make a pastry, or asking directions from a robot police officer. In both of these cases, making hand gestures would aid the verbal descriptions. In the first case, the robot would be recognizing gestures made by the human, and perhaps repeating them for confirmation. In the second case, the robot police officer would gesture to indicate "down the road, then turn right". It is likely that gestures will make up a part of the interaction between humans and robots. A great many systems have been developed to recognize human hand gestures. 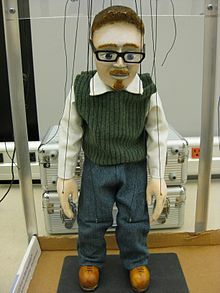 Puppet Magnus, a robot-manipulated marionette with complex control systems. RuBot II can manually resolve Rubik's cubes. The mechanical structure of a robot must be controlled to perform tasks. The control of a robot involves three distinct phases – perception, processing, and action (robotic paradigms). Sensors give information about the environment or the robot itself (e.g. the position of its joints or its end effector). This information is then processed to be stored or transmitted and to calculate the appropriate signals to the actuators (motors) which move the mechanical. TOPIO, a humanoid robot, played ping pong at Tokyo IREX 2009. Direct interaction is used for haptic or teleoperated devices, and the human has nearly complete control over the robot's motion. Operator-assist modes have the operator commanding medium-to-high-level tasks, with the robot automatically figuring out how to achieve them. An autonomous robot may go without human interaction for extended periods of time . Higher levels of autonomy do not necessarily require more complex cognitive capabilities. For example, robots in assembly plants are completely autonomous but operate in a fixed pattern. Teleoperation. A human controls each movement, each machine actuator change is specified by the operator. Supervisory. A human specifies general moves or position changes and the machine decides specific movements of its actuators. Task-level autonomy. The operator specifies only the task and the robot manages itself to complete it. Full autonomy. The machine will create and complete all its tasks without human interaction. Much of the research in robotics focuses not on specific industrial tasks, but on investigations into new types of robots, alternative ways to think about or design robots, and new ways to manufacture them. Other investigations, such as MIT's cyberflora project, are almost wholly academic. A first particular new innovation in robot design is the open sourcing of robot-projects. To describe the level of advancement of a robot, the term "Generation Robots" can be used. This term is coined by Professor Hans Moravec, Principal Research Scientist at the Carnegie Mellon University Robotics Institute in describing the near future evolution of robot technology. First generation robots, Moravec predicted in 1997, should have an intellectual capacity comparable to perhaps a lizard and should become available by 2010. Because the first generation robot would be incapable of learning, however, Moravec predicts that the second generation robot would be an improvement over the first and become available by 2020, with the intelligence maybe comparable to that of a mouse. The third generation robot should have the intelligence comparable to that of a monkey. Though fourth generation robots, robots with human intelligence, professor Moravec predicts, would become possible, he does not predict this happening before around 2040 or 2050. In each area mentioned above, researchers strive to develop new concepts and strategies, improve existing ones, and improve the interaction between these areas. To do this, criteria for "optimal" performance and ways to optimize design, structure, and control of robots must be developed and implemented. There has been some research into whether robotics algorithms can be run more quickly on quantum computers than they can be run on digital computers. This area has been referred to as quantum robotics. There are lots of competitions all around the globe. The SeaPerch curriculum is aimed as students of all ages. This is a short list of competition examples; for a more complete list see Robot competition. The FIRST organization offers the FIRST Lego League Jr. competitions for younger children. This competition's goal is to offer younger children an opportunity to start learning about science and technology. Children in this competition build Lego models and have the option of using the Lego WeDo robotics kit. One of the most important competitions is the FLL or FIRST Lego League. The idea of this specific competition is that kids start developing knowledge and getting into robotics while playing with Lego since they are 9 years old. This competition is associated with National Instruments. Children use Lego Mindstorms to solve autonomous robotics challenges in this competition. The FIRST Tech Challenge is designed for intermediate students, as a transition from the FIRST Lego League to the FIRST Robotics Competition. The FIRST Robotics Competition focuses more on mechanical design, with a specific game being played each year. Robots are built specifically for that year's game. In match play, the robot moves autonomously during the first 15 seconds of the game (although certain years such as 2019's Deep Space change this rule), and is manually operated for the rest of the match. The various RoboCup competitions include teams of teenagers and university students. These competitions focus on soccer competitions with different types of robots, dance competitions, and urban search and rescue competitions. All of the robots in these competitions must be autonomous. Some of these competitions focus on simulated robots. AUVSI runs competitions for flying robots, robot boats, and underwater robots. The Student AUV Competition Europe  (SAUC-E) mainly attracts undergraduate and graduate student teams. As in the AUVSI competitions, the robots must be fully autonomous while they are participating in the competition. The Microtransat Challenge is a competition to sail a boat across the Atlantic Ocean. RoboGames is open to anyone wishing to compete in their over 50 categories of robot competitions. Federation of International Robot-soccer Association holds the FIRA World Cup competitions. There are flying robot competitions, robot soccer competitions, and other challenges, including weightlifting barbells made from dowels and CDs. Robotics is an essential component in many modern manufacturing environments. As factories increase their use of robots, the number of robotics–related jobs grow and have been observed to be steadily rising. The employment of robots in industries has increased productivity and efficiency savings and is typically seen as a long term investment for benefactors. A paper by Michael Osborne and Carl Benedikt Frey found that 47 per cent of US jobs are at risk to automation "over some unspecified number of years". These claims have been criticized on the ground that social policy, not AI, causes unemployment. The greatest OSH benefits stemming from the wider use of robotics should be substitution for people working in unhealthy or dangerous environments. 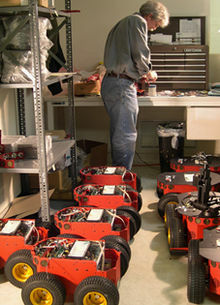 In space, defence, security, or the nuclear industry, but also in logistics, maintenance, and inspection, autonomous robots are particularly useful in replacing human workers performing dirty, dull or unsafe tasks, thus avoiding workers' exposures to hazardous agents and conditions and reducing physical, ergonomic and psychosocial risks. For example, robots are already used to perform repetitive and monotonous tasks, to handle radioactive material or to work in explosive atmospheres. In the future, many other highly repetitive, risky or unpleasant tasks will be performed by robots in a variety of sectors like agriculture, construction, transport, healthcare, firefighting or cleaning services. Despite these advances, there are certain skills to which humans will be better suited than machines for some time to come and the question is how to achieve the best combination of human and robot skills. The advantages of robotics include heavy-duty jobs with precision and repeatability, whereas the advantages of humans include creativity, decision-making, flexibility and adaptability. This need to combine optimal skills has resulted in collaborative robots and humans sharing a common workspace more closely and led to the development of new approaches and standards to guarantee the safety of the "man-robot merger". Some European countries are including robotics in their national programmes and trying to promote a safe and flexible co-operation between robots and operators to achieve better productivity. For example, the German Federal Institute for Occupational Safety and Health (BAuA) organises annual workshops on the topic "human-robot collaboration". ^ Carne, Nick (March 8, 2019). "Researchers make a million tiny robots". Cosmos Magazine. Retrieved March 8, 2019. ^ a b Zunt, Dominik. "Who did actually invent the word "robot" and what does it mean?". The Karel Čapek website. Archived from the original on 2013-01-23. Retrieved 2017-02-05. ^ Asimov, Isaac (1996) . "The Robot Chronicles". Gold. London: Voyager. pp. 224–225. ISBN 978-0-00-648202-4. ^ "Robotics: About the Exhibition". The Tech Museum of Innovation. Archived from the original on 2008-09-13. Retrieved 2008-09-15. ^ Needham, Joseph (1991). Science and Civilisation in China: Volume 2, History of Scientific Thought. Cambridge University Press. ISBN 978-0-521-05800-1. ^ PhD, Renato M.E. Sabbatini. "Sabbatini, RME: An Imitation of Life: The First Robots". ^ Waurzyniak, Patrick (2006). "Masters of Manufacturing: Joseph F. Engelberger". Society of Manufacturing Engineers. 137 (1). Archived from the original on 2011-11-09. ^ Zeghloul, Saïd; Laribi, Med Amine; Gazeau, Jean-Pierre (21 September 2015). Robotics and Mechatronics: Proceedings of the 4th IFToMM International Symposium on Robotics and Mechatronics. Springer. ISBN 9783319223681 – via Google Books. ^ Duffy, Vincent G. (19 April 2016). Handbook of Digital Human Modeling: Research for Applied Ergonomics and Human Factors Engineering. CRC Press. ISBN 9781420063523 – via Google Books. 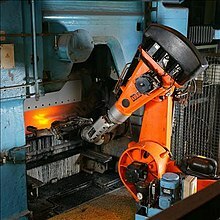 ^ "KUKA Industrial Robot FAMULUS". Retrieved 2008-01-10. ^ "History of Industrial Robots" (PDF). Archived from the original (PDF) on 2012-12-24. Retrieved 2012-10-27. ^ Hunt, V. Daniel (1985). "Smart Robots". Smart Robots: A Handbook of Intelligent Robotic Systems. Chapman and Hall. p. 141. ISBN 978-1-4613-2533-8. ^ "Robot density rises globally". Robotic Industries Association. February 8, 2018. Retrieved December 3, 2018. ^ Pinto, Jim (October 1, 2003). "Fully automated factories approach reality". Automation World. Retrieved December 3, 2018. ^ Dragani, Rachelle (November 8, 2018). "Can a robot make you a 'superworker'?". Verizon Communications. Retrieved December 3, 2018. ^ Pollock, Emily (June 7, 2018). "Construction Robotics Industry Set to Double by 2023". engineering.com. Retrieved December 3, 2018. ^ Grift, Tony E. (2004). "Agricultural Robotics". University of Illinois at Urbana–Champaign. Archived from the original on 2007-05-04. Retrieved December 3, 2018. ^ Thomas, Jim (November 1, 2017). "How corporate giants are automating the farm". New Internationalist. Retrieved December 3, 2018. ^ "OUCL Robot Sheepdog Project". Department of Computer Science, University of Oxford. July 3, 2001. Retrieved December 3, 2018. ^ Kolodny, Lora (July 4, 2017). "Robots are coming to a burger joint near you". CNBC. Retrieved December 3, 2018. ^ Corner, Stuart (November 23, 2017). "AI-driven robot makes 'perfect' flatbread". iothub.com.au. Retrieved December 3, 2018. ^ Eyre, Michael (September 12, 2014). "'Boris' the robot can load up dishwasher". BBC News. Retrieved December 3, 2018. ^ One database, developed by the United States Department of Energy contains information on almost 500 existing robotic technologies and can be found on the D&D Knowledge Management Information Tool. ^ Dowling, Kevin. "Power Sources for Small Robots" (PDF). Carnegie Mellon University. Retrieved 11 May 2012. ^ Pratt, Jerry E.; Krupp, Benjamin T. (2004). "Series Elastic Actuators for legged robots". Unmanned Ground Vehicle Technology VI. Unmanned Ground Vehicle Technology Vi. 5422. pp. 135–144. Bibcode:2004SPIE.5422..135P. CiteSeerX 10.1.1.107.349. doi:10.1117/12.548000. ^ www.imagesco.com, Images SI Inc -. "Air Muscle actuators, going further, page 6". ^ "Air Muscles". Shadow Robot. Archived from the original on 2007-09-27. ^ Tondu, Bertrand (2012). "Modelling of the McKibben artificial muscle: A review". Journal of Intelligent Material Systems and Structures. 23 (3): 225–253. doi:10.1177/1045389X11435435. ^ "TALKING ELECTRONICS Nitinol Page-1". Talkingelectronics.com. Retrieved 2010-11-27. ^ "lf205, Hardware: Building a Linux-controlled walking robot". Ibiblio.org. 2001-11-01. Retrieved 2010-11-27. ^ "WW-EAP and Artificial Muscles". Eap.jpl.nasa.gov. Retrieved 2010-11-27. ^ "Empa – a117-2-eap". Empa.ch. Retrieved 2010-11-27. ^ "Electroactive Polymers (EAP) as Artificial Muscles (EPAM) for Robot Applications". Hizook. Retrieved 2010-11-27. ^ "Piezo LEGS – -09-26". ^ "Squiggle Motors: Overview". Retrieved 2007-10-08. ^ Nishibori; et al. (2003). 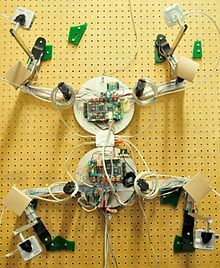 "Robot Hand with Fingers Using Vibration-Type Ultrasonic Motors (Driving Characteristics)". Journal of Robotics and Mechatronics. 15 (6): 588–595. doi:10.20965/jrm.2003.p0588. ^ Otake; et al. (2001). "Shape Design of Gel Robots made of Electroactive Polymer trolo Gel" (PDF). Retrieved 2007-10-16. ^ "Syntouch LLC: BioTac(R) Biomimetic Tactile Sensor Array". Retrieved 2009-08-10. ^ Wettels, N; Santos, VJ; Johansson, RS; Loeb, Gerald E.; et al. (2008). "Biomimetic tactile sensor array". Advanced Robotics. 22 (8): 829–849. doi:10.1163/156855308X314533. ^ "What is The SmartHand?". SmartHand Project. Retrieved 4 February 2011. ^ "What is a robotic end-effector?". ATI Industrial Automation. 2007. Retrieved 2007-10-16. ^ Crane, Carl D.; Joseph Duffy (1998). Kinematic Analysis of Robot Manipulators. Cambridge University Press. ISBN 978-0-521-57063-3. Retrieved 2007-10-16. ^ "Delft hand". TU Delft. Archived from the original on 2012-02-03. Retrieved 2011-11-21. ^ M&C. "TU Delft ontwikkelt goedkope, voorzichtige robothand". ^ "astrictive definition – English definition dictionary – Reverso". ^ Tijsma, H. A.; Liefhebber, F.; Herder, J. L. (1 June 2005). "Evaluation of new user interface features for the MANUS robot arm" (PDF). 9th International Conference on Rehabilitation Robotics, 2005. ICORR 2005. pp. 258–263. doi:10.1109/ICORR.2005.1501097. ISBN 978-0-7803-9003-4 – via IEEE Xplore. ^ Allcock, Andrew (2006). "Anthropomorphic hand is almost human". Machinery. Archived from the original on 2007-09-28. Retrieved 2007-10-17. ^ "T.O.B.B". Mtoussaint.de. Retrieved 2010-11-27. ^ "nBot, a two wheel balancing robot". Geology.heroy.smu.edu. Retrieved 2010-11-27. ^ "ROBONAUT Activity Report". NASA. 2004. Archived from the original on 2007-08-20. Retrieved 2007-10-20. ^ "IEEE Spectrum: A Robot That Balances on a Ball". Spectrum.ieee.org. 2010-04-29. Retrieved 2010-11-27. ^ "Carnegie Mellon Researchers Develop New Type of Mobile Robot That Balances and Moves on a Ball Instead of Legs or Wheels" (Press release). Carnegie Mellon. 2006-08-09. Archived from the original on 2007-06-09. Retrieved 2007-10-20. ^ "Spherical Robot Can Climb Over Obstacles". BotJunkie. Retrieved 2010-11-27. ^ "Rotundus". Rotundus.se. Retrieved 2010-11-27. ^ "OrbSwarm Gets A Brain". BotJunkie. 2007-07-11. Retrieved 2010-11-27. ^ "Rolling Orbital Bluetooth Operated Thing". BotJunkie. Retrieved 2010-11-27. ^ "Swarm". Orbswarm.com. Retrieved 2010-11-27. ^ "The Ball Bot : Johnnytronic@Sun". Blogs.sun.com. Archived from the original on 2011-08-24. Retrieved 2010-11-27. ^ "Senior Design Projects | College of Engineering & Applied Science| University of Colorado at Boulder". Engineering.colorado.edu. 2008-04-30. Retrieved 2010-11-27. 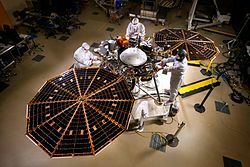 ^ "JPL Robotics: System: Commercial Rovers". ^ "Micromagic Systems Robotics Lab". ^ "AMRU-5 hexapod robot" (PDF). ^ "Achieving Stable Walking". Honda Worldwide. Retrieved 2007-10-22. ^ "Funny Walk". Pooter Geek. 2004-12-28. Retrieved 2007-10-22. ^ "ASIMO's Pimp Shuffle". Popular Science. 2007-01-09. Retrieved 2007-10-22. ^ "The Temple of VTEC – Honda and Acura Enthusiasts Online Forums > Robot Shows Prime Minister How to Loosen Up > > A drunk robot?". ^ "3D One-Leg Hopper (1983–1984)". MIT Leg Laboratory. Retrieved 2007-10-22. ^ "3D Biped (1989–1995)". MIT Leg Laboratory. ^ "Quadruped (1984–1987)". MIT Leg Laboratory. ^ "MIT Leg Lab Robots- Main". ^ "About the robots". Anybots. Archived from the original on 2007-09-09. Retrieved 2007-10-23. ^ "Homepage". Anybots. Retrieved 2007-10-23. ^ "Dexter Jumps video". YouTube. 2007-03-01. Retrieved 2007-10-23. ^ Collins, Steve; Wisse, Martijn; Ruina, Andy; Tedrake, Russ (2005-02-11). "Efficient bipedal robots based on passive-dynamic Walkers" (PDF). Science. 307 (5712): 1082–1085. Bibcode:2005Sci...307.1082C. doi:10.1126/science.1107799. PMID 15718465. Archived from the original (PDF) on 2007-06-22. Retrieved 2007-09-11. ^ Collins, Steve; Ruina, Andy. "A bipedal walking robot with efficient and human-like gait" (PDF). Proc. IEEE International Conference on Robotics and Automation. ^ "Testing the Limits" (PDF). Boeing. p. 29. Retrieved 2008-04-09. ^ Miller, Gavin. "Introduction". snakerobots.com. Retrieved 2007-10-22. ^ "ACM-R5". Archived from the original on 2011-10-11. ^ "Swimming snake robot (commentary in Japanese)". ^ "Commercialized Quadruped Walking Vehicle "TITAN VII"". Hirose Fukushima Robotics Lab. Archived from the original on 2007-11-06. Retrieved 2007-10-23. ^ "Plen, the robot that skates across your desk". SCI FI Tech. 2007-01-23. Archived from the original on 2007-10-11. Retrieved 2007-10-23. ^ Sfakiotakis; et al. (1999). "Review of Fish Swimming Modes for Aquatic Locomotion" (PDF). IEEE Journal of Oceanic Engineering. 24 (2): 237–252. Bibcode:1999IJOE...24..237S. doi:10.1109/48.757275. Archived from the original (PDF) on 2007-09-26. Retrieved 2007-10-24. ^ "High-Speed Robotic Fish | iSplash". isplash-robot. Retrieved 2017-01-07. ^ "iSplash-II: Realizing Fast Carangiform Swimming to Outperform a Real Fish" (PDF). Robotics Group at Essex University. Retrieved 2015-09-29. ^ "iSplash-I: High Performance Swimming Motion of a Carangiform Robotic Fish with Full-Body Coordination" (PDF). Robotics Group at Essex University. Retrieved 2015-09-29. ^ Jaulin, L.; Le Bars, F. (2012). 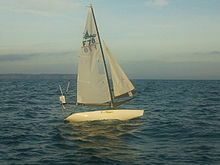 "An interval approach for stability analysis; Application to sailboat robotics" (PDF). IEEE Transactions on Robotics. 27 (5). ^ "Survey of the State of the Art in Human Language Technology: 1.2: Speech Recognition". Archived from the original on 2007-11-11. ^ Fournier, Randolph Scott., and B. June. Schmidt. "Voice Input Technology: Learning Style and Attitude Toward Its Use." Delta Pi Epsilon Journal 37 (1995): 1_12. ^ "History of Speech & Voice Recognition and Transcription Software". Dragon Naturally Speaking. Retrieved 2007-10-27. ^ Cheng Lin, Kuan; Huang, Tien‐Chi; Hung, Jason C.; Yen, Neil Y.; Ju Chen, Szu (2013-06-07). Chen, Mu‐Yen (ed.). "Facial emotion recognition towards affective computing‐based learning". Library Hi Tech. 31 (2): 294–307. doi:10.1108/07378831311329068. ISSN 0737-8831. ^ Tristan Bowles, Sandra Pauletto, (2010). Emotions in the Voice: Humanising a Robotic Voice. In: Proceedings of the 7th Sound and Music Computing Conference, Barcelona, Spain. ^ Waldherr, Romero & Thrun (2000). "A Gesture Based Interface for Human-Robot Interaction" (PDF). Kluwer Academic Publishers. Retrieved 2007-10-28. ^ Markus Kohler (2012). "Vision Based Hand Gesture Recognition Systems". Applied Mechanics and Materials. University of Dortmund. 263-266: 2422–2425. Bibcode:2012AMM...263.2422L. doi:10.4028/www.scientific.net/AMM.263-266.2422. Archived from the original on 2012-07-11. Retrieved 2007-10-28. ^ "Frubber facial expressions". Archived from the original on 2009-02-07. ^ "Best Inventions of 2008 – TIME". Time. 29 October 2008 – via www.time.com. 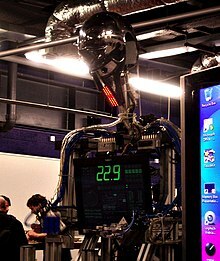 ^ "Kismet: Robot at MIT's AI Lab Interacts With Humans". Sam Ogden. Archived from the original on 2007-10-12. Retrieved 2007-10-28. ^ "(Park et al. 2005) Synthetic Personality in Robots and its Effect on Human-Robot Relationship" (PDF). ^ "Robot Receptionist Dishes Directions and Attitude". ^ "New Scientist: A good robot has personality but not looks" (PDF). Archived from the original (PDF) on 2006-09-29. ^ "Playtime with Pleo, your robotic dinosaur friend". ^ Jennifer Bogo (October 31, 2014). "Meet a woman who trains robots for a living". ^ "A Ping-Pong-Playing Terminator". Popular Science. ^ Sandhana, Lakshmi (2002-09-05). "A Theory of Evolution, for Robots". Wired. Wired Magazine. Retrieved 2007-10-28. ^ Experimental Evolution In Robots Probes The Emergence Of Biological Communication. Science Daily. 2007-02-24. Retrieved 2007-10-28. ^ Žlajpah, Leon (2008-12-15). "Simulation in robotics". Mathematics and Computers in Simulation. 79 (4): 879–897. doi:10.1016/j.matcom.2008.02.017. ^ News, Technology Research. "Evolution trains robot teams TRN 051904". www.trnmag.com. ^ Agarwal, P.K. Elements of Physics XI. Rastogi Publications. p. 2. ISBN 978-81-7133-911-2. ^ Tandon, Prateek (2017). Quantum Robotics. Morgan & Claypool Publishers. ISBN 978-1627059138. ^ Saad, Ashraf; Kroutil, Ryan (2012). Hands-on Learning of Programming Concepts Using Robotics for Middle and High School Students. Proceedings of the 50th Annual Southeast Regional Conference of the Association for Computer Machinery. ACM. pp. 361–362. 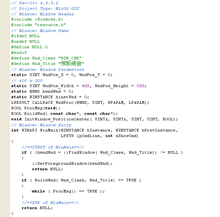 doi:10.1145/2184512.2184605. ^ "Robotics Degree Programs at Worcester Polytechnic Institute". Worcester Polytechnic Institute. 2013. Retrieved 2013-04-12. ^ "Student AUV Competition Europe". ^ "LEGO® Building & Robotics After School Programs". Retrieved 5 November 2014. ^ Toy, Tommy (June 29, 2011). 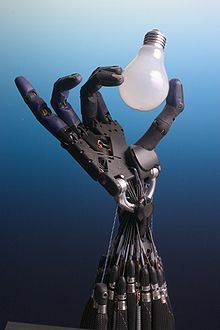 "Outlook for robotics and Automation for 2011 and beyond are excellent says expert". PBT Consulting. Retrieved 2012-01-27. ^ Frey, Carl Benedikt; Osborne, Michael A. (2017-01-01). "The future of employment: How susceptible are jobs to computerisation?". Technological Forecasting and Social Change. 114: 254–280. CiteSeerX 10.1.1.395.416. doi:10.1016/j.techfore.2016.08.019. ISSN 0040-1625. ^ E McGaughey, 'Will Robots Automate Your Job Away? Full Employment, Basic Income, and Economic Democracy' (2018) SSRN, part 2(3). DH Autor, ‘Why Are There Still So Many Jobs? The History and Future of Workplace Automation’ (2015) 29(3) Journal of Economic Perspectives 3. ^ "Focal Points Seminar on review articles in the future of work – Safety and health at work – EU-OSHA". osha.europa.eu. Retrieved 2016-04-19. ^ "Robotics: Redefining crime prevention, public safety and security". SourceSecurity.com. ^ "Draft Standard for Intelligent Assist Devices — Personnel Safety Requirements" (PDF). ^ "ISO/TS 15066:2016 – Robots and robotic devices – Collaborative robots". R. Andrew Russell (1990). Robot Tactile Sensing. New York: Prentice Hall. ISBN 978-0-13-781592-0.